*The only caveat to my PSA (public service announcement) is when someone confides in you about her plans, struggles, etc. If and only then should you check in. I mean, really? Look, I know these questioners are generally well-meaning. These days, baby comments/questions ‘seem’ as normal as ones about the weather. And in one respect, it ‘seems’ like people are more comfortable than ever sharing personal tidbits of information via social media. However, that still doesn’t make it acceptable to ask a woman who looks to be in her child-bearing years when she’s planning to have kids. Just bite your tongue and know that if/when she becomes pregnant, you will definitely know. Vishnu and I consider ourselves very lucky. I was 32 when I got pregnant with Kaiden but that was by choice. We didn’t have any real issues conceiving. So yes, while the questions are annoying and invasive and insensitive, they don’t bother me that much. That’s not the case for everyone. Please know that your question about when someone’s planning to have kids could trigger a number of emotions, thoughts, etc. You don’t know how long this person’s been trying to get pregnant. It doesn’t come easy to most. You don’t know if this person is currently undergoing medical treatments in order to get pregnant. You don’t know if this person has miscarried and how many times. You can’t see the pain a woman carries in her heart. You don’t know if this person has been told that she will never be able to carry a child to term. Again, this isn’t something you can see/read on someone’s face. And just because someone had a ‘seemingly’ easy time getting pregnant with baby #1, you don’t know the story with subsequent babies (see above). It’s never appropriate to ask. Then there’s the other side of the coin. Just because a woman can get pregnant doesn’t mean she should. Believe it or not, there are people who don’t want children. And that is absolutely ok. Again I repeat, just because you can do something doesn’t mean you should/want to. But most importantly, and I mean this in the nicest way possible, it really just isn’t any of your business when someone is planning to have kids. Or if they’re planning to have kids. So don’t ask. You’ll know when you know. April is National Cesarean Awareness Month. When I learned this, I wanted to share something that’s been on my mind for a while now. There are people out there who think c-sections are the easy way out (I’ve seen plenty of disgusting comments/headlines about this topic). A lazy mom’s journey to delivery, if you will. Having gone through it myself, I’m here to tell you it’s not easy. Not by a long shot. 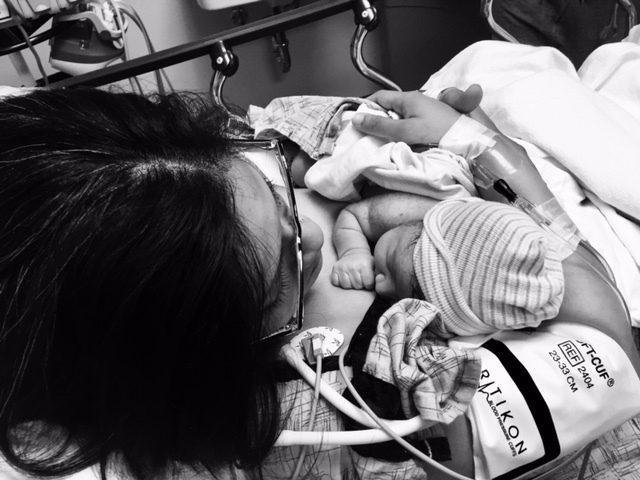 I honestly no longer think too much about my emergency C-section. It happened. At the end of it, I got my beautiful, healthy baby boy. My experience, while scary, turned out ok. Thank goodness. Now, before I share more of my thoughts, I have to state that I’m not pitting c-section moms against vaginal delivery moms. Or saying one way is harder than the other. Not by any means. It’s all hard! I have yet to meet a mom who truly thinks her delivery was easy. The process of bringing a baby into the world is hard work. Period. I envisioned a vaginal delivery up until the very end. Having to come to terms with the fact that we were now facing a situation I never thought about or planned for was not easy. And honestly, I dealt with those emotions for weeks after Kaiden’s birth. That wasn’t easy either. The operating room felt like it was 30 degrees. I don’t think I’ve ever shivered that much or that hard. I couldn’t focus and wanted to cry the whole time. Not easy. Because of the infection running through my body and the fact that the doctor had to cut through my belly into my uterus to get my baby out, I couldn’t hold Kaiden right away. They had to administer a number of tests first. Not the end of the world but not easy. A picture I’ve shared on the blog before and likely will for years to come! Our first mama + K pic! I couldn’t get out of my hospital bed for over two days, and when I tried, I fell right back down. That 10 inch incision in my belly was painful and not easy to deal with. The pain didn’t stop at the hospital. I continued to roll out of bed (like I did during pregnancy) for weeks because any other position hurt like hell. Not easy. Oh and that scar? It still itches from time to time. And yes, sometimes I feel a strange sensation too. Eh, not too bad! The point of this post is not to claim all the ways ‘woe is me.’ Like I said right up front, we have Kaiden now and that’s all that matters. He met us via a different ‘door’ if you will, but he’s here nonetheless. And for that I will be forever thankful! Something else to understand about c-sections is that most women don’t plan to have one. Some do, I know, but all of the women I know who ended up having one didn’t plan on it (it’s actually very risky). A long labor process, an infection, the baby’s positioning, or some other circumstance took them down a different path. An unplanned path I know they were all ultimately thankful for. So while it may seem like major abdominal surgery is the easier way to deliver a baby, trust me, it’s not. There is no easy way out regardless of what path you end up going down! The name Kaiden randomly came to me one day. I ran it past Vishnu, and surprisingly, he liked it a lot too. Then we got into the discussion of how to spell it. Obviously, we ultimately decided on the K and I version of the name. Next came the question of what exactly does Kaiden mean (our parents were very curious!). Well, after checking multiple sites, we learned that Kaiden means ‘warrior’ and ‘fighter.’ Little did we know how fitting our little man’s name would be come time for him to make his grand entrance into the world! Kaiden’s birth story starts two days before I actually delivered. 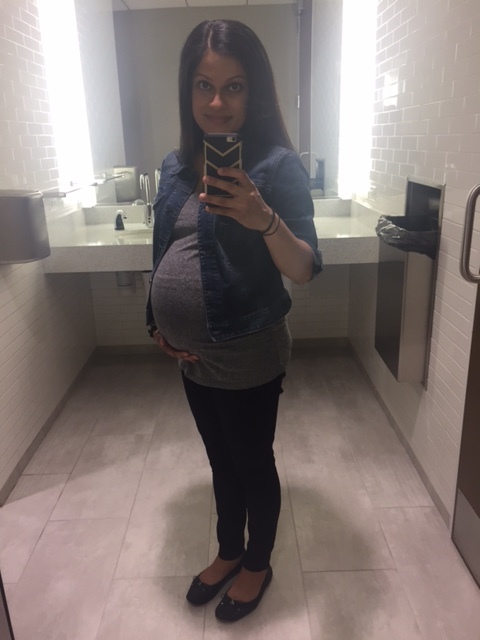 On Tuesday morning, I walked to my OBGYN’s office for my 38 week appointment. I was told that everything looked good and that I was only a fingertip dilated. With that, I walked to work thinking I had a couple of more weeks until it was go time. I had a very normal day at work and even joined my colleagues for dinner that night. After checking emails and tying up a few loose ends, I laid down because the chills were back. I checked my temperature, and it was 100.8. I called the doctor back, left a message and immediately texted Vishnu. He told me he was on his way home in case we were told to head to the hospital. I also talked to my sister who was able to leave work early and come over in case Vishnu didn’t make it on time. I checked my temperature again and it came back as 102.5. I checked one more time right before Aekta and Vishnu got home and it was 103.1. The doctor’s office called back, I told them everything that happened since the last time we talked. Needless to say, I was given the ok to head to the hospital. Vishnu, Aekta, and I quickly headed out the door around 2:15 pm with my hospital bag in tow. For some reason, I honestly thought this was all a false alarm and that we would be back home in a few hours. We checked into the hospital, and Vishnu and I were immediately taken to a triage room where a nurse examined me. I was only 1-1.5 centimeters dilated at the time, however my fever was now registering at 103.8, and Kaiden’s heart rate was nearing the 200s. An OBGYN resident came to do an ultrasound of the baby and told us that my amniotic sac was nearly drained of all it’s fluid. He asked if I ever felt my water break or experienced anything remotely like that. The answer was no. He went on to tell us that the likely cause of my fever was an infection of the amniotic sac/fluid potentially caused by a small rupture that slowly allowed my water to leak out…or vice versa. Chorioamnionitis was what I was diagnosed with. A term I’ll never forget. Once the team of doctors agreed on the diagnosis, everything moved sort of fast (at least for me). At this time, my contractions were coming in stronger and more regularly. I sat in the triage bed with Vishnu by my side screaming in pain and begging for the epidural. Eventually, we moved upstairs to labor and delivery where I thought I would be delivering Kaiden. At this time, the anesthesiologist’s assistant came in to administer the epidural, as my contractions were coming more frequently. As she was setting everything up, my nurse mentioned my fever, which triggered a no go on the epidural front, as I hadn’t been given antibiotics yet. I had to wait another 1.5-2 hours. During this time, the baby’s heart rate periodically decelerated based on how I was positioned. The nurse came by every so often to shift my body and give me oxygen. Eventually, the epidural was administered. This helped tremendously with the pain. To make an already long story short, the OBGYN came to talk to us about our options around 11:45 pm. We could either wait to deliver the baby vaginally, or we could opt for a c-section. Her preference was a c-section, as I was still only 2 centimeters dilated. This meant I would likely be in labor for hours longer, and we would potentially still have to go the c-section route. The doctor was also worried about the stress a vaginal delivery would place on the baby. Her main goal was to get Kaiden out safely before my condition worsened. At this point, I looked to Vishnu to make an informed decision. This was also exactly when my mom arrived (she changed her flight earlier that morning, as did Vishnu’s parents who arrived Friday afternoon). We talked it over and decided to go the c-section route because of the infection, the baby’s decelerating heart rate, and the overall risk of a vaginal delivery. Within 15 minutes, we were headed to the OR. And within another 30 minutes, Kaiden made his healthy grand entrance. If there’s one thing I will be grateful for for the rest of my life, it’s the fact that he was born 100% unaffected by the infection and everything else that went on. He didn’t let me know it at the time, but Vishnu later told me he was really scared for the baby. So much could’ve gone wrong, and I thank God it didn’t. After taking him out, Kaiden was taken to another room for his examination. Soon thereafter, Vishnu was allowed to see him. He came back and told me how cute our baby was. 🙂 A few minutes later, the nurses brought him back for me to hold. I can’t adequately explain how I felt in that moment. It really is a love unlike any other! Vishnu and I, through our love, created a little human…our little human. I’ve never felt such pure joy in my life…honestly, I felt like I was on top of the world. Over the course of the next four nights, both Kaiden and I were monitored closely, given antibiotics, etc.. Other than my fever spiking once more, we didn’t experience any other health concerns from the delivery. So thankful for the care and attention we received. The doctors, residents, and nurses at the hospital treated us like family, and that’s something we’ll never forget. Overall, I’m grateful Kaiden was/is ok and remained healthy throughout everything that happened. I would be lying if I said I wasn’t shocked things went down the way they did. 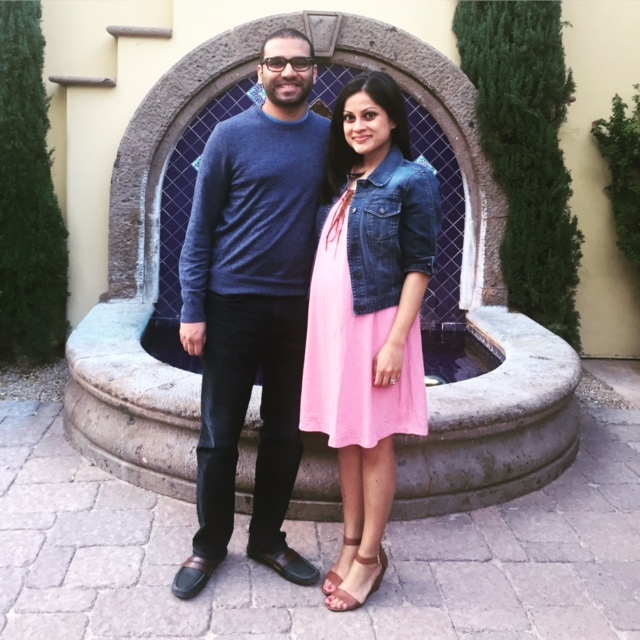 My pregnancy couldn’t have been smoother (with a few expected and normal bumps along the way). I worked out consistently, I ate healthily 90% of the time, and I truly felt great. So to learn I had an infection and would have to undergo a c-section was out of left field for me. But with the grace of God and positive thoughts, we got through it unscathed! And who knows, maybe Kaiden had the strength to fight because I tried to take the best care of myself over the past nine months. We’re now at home adjusting to our new and very full life. Kaiden is doing so well, and I’m recovering faster than expected. Vishnu and my mom are honestly my rocks right now. Vishnu, despite going back to work, wakes up for the middle of the night feedings, diaper changes, etc. He’s our expert swaddler and burper! Seeing him be a dad is truly amazing. I didn’t think it was possible, but my love for him grew exponentially overnight. And my mom is simply the best. Not only does she cook and clean (all day long), but she also spends every other minute of the day loving on Kaiden and taking care of me. 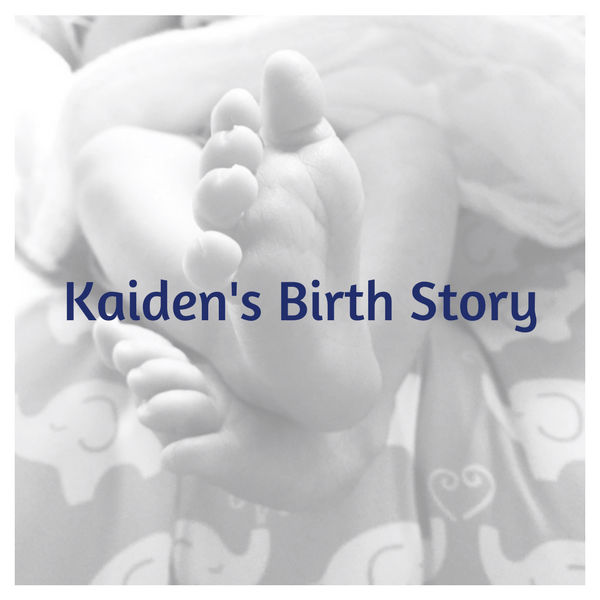 And that, my friends, is Mr. Kaiden’s birth story. Not exactly what I expected to experience but beyond thankful that our little guy is a-ok! Maternity wear. Something I knew close to nothing about prior to getting pregnant. My knowledge pretty much extended to my coworker Erin’s pregnancy wardrobe. Good thing I’m a quick learner with friends who are willing to help a girl out! Starting at the end of February/early March, I subscribed to Le Tote after seeing how much Erin loved her experience with the company. Le Tote is an online maternity (and non-maternity) wear rental service, and it’s pretty awesome. There are also options to pair clothing with accessories if that’s more your thing. For $69 a month, I chose to receive four pieces of clothing (tops, sweaters, dresses, pants, etc.) in every tote. Once I wear everything as many times as I want, I send it back using the prepaid envelope from Le Tote, pick my next pieces, and wait for the next tote. There are no limits to the number of totes you receive every month. It’s just a matter of how long you keep each individual one (shipping takes about two days). And get this, you don’t have to wash anything (major perk)! Personally, when I weighed out buying a work appropriate maternity wardrobe versus subscribing to Le Tote, Le Tote won! It’s a fun treat for me to look forward to, and it gives me access to lots of different styles and options I wouldn’t otherwise have. The only con to Le Tote is their sizing, specifically in the petite department. Some pieces, even when I picked XS’, would be too big. A little annoying when you only get four pieces to start with! Other than that, I would sign up for this service all over again given the choice. I personally didn’t buy too many maternity pieces from Target, but it’s a great/affordable option. If you’re looking for more casual clothing, I would check out a few different local stores. I quickly learned that the Target in the city isn’t the same as the one in the suburbs. I was blown away by how different the one by my friend Thea is. So many more options…the burbs for the win! Speaking of the burbs, I went shopping with Thea back in February, and we stopped by the local Destination Maternity. This store carries both the Motherhood Maternity and the Pea in the Pod lines. I bought a few different basic pieces here and have no regrets – a pair of jeans, a pair of black work pants, and a casual top from the Motherhood Maternity line and two nicer tops from the more expensive Pea in the Pod line. 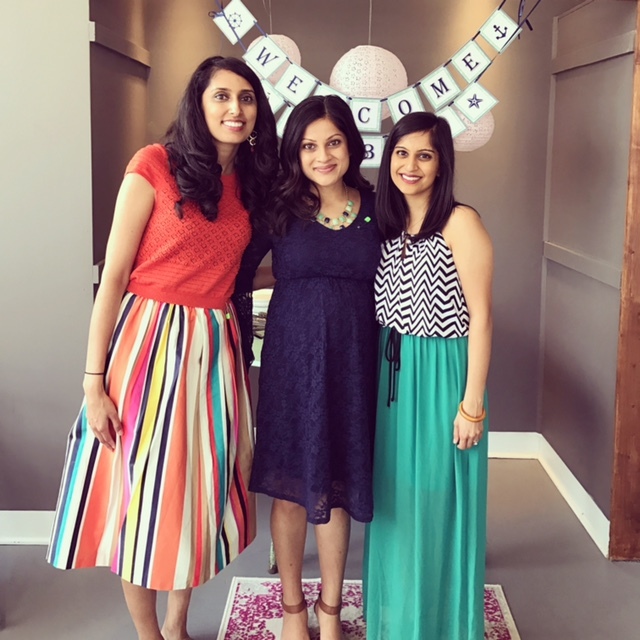 Pink Blush Maternity is an online retailer that sells super cute maternity wear. I bought a few dresses from here and love them all! Everything is pretty much true to size and fairly affordable. I found this to be a great option for special occasion pieces like baby showers. Other than the above, I also regularly wear a few of my flowy non-maternity tops. Don’t forget the pieces you already own! 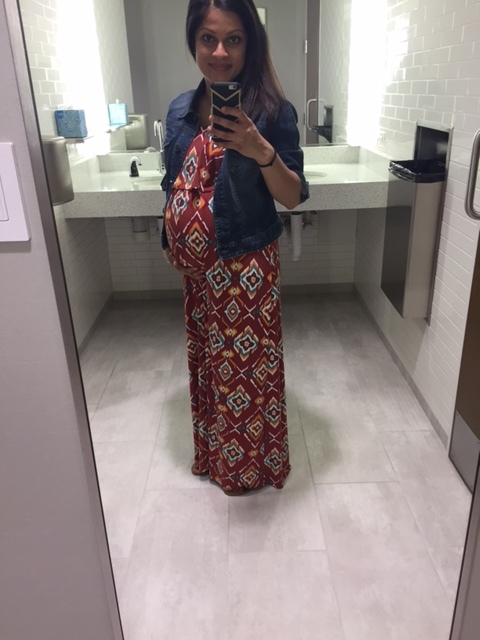 So there you have it, the maternity wear that kept this working mom-to-be somewhat stylish (and clothed!) for the majority of this pregnancy. The title of this post is colored with sarcasm. While the third trimester is a special one (the light is dimly visible! ), it’s much harder than I personally thought it would be (especially from around 32 weeks onward)! Of course, every woman and pregnancy is different, but if I had to sum up the past few weeks in one word, it would be uncomfortable. However, before we go down that road, let me share some of the highlights. With every passing day, we’re closer to meeting our little guy. It’s probably the hormones, but I literally tear up every time I think about holding/seeing him for the first time! Over the past few weeks, Baby K has gone from kicking/punching to rolling around. At first, it felt a little strange, but now I look forward to experiencing his new moves. It’s one of the coolest feelings ever. I still can’t believe there’s a little human growing inside of me! Organizing all of the baby stuff we bought/were gifted was a lot of fun. We’re a little behind on the nursery front, but we figure our little guy won’t be too mad about that! We’ll get to it sooner than later. Annnd…that’s pretty much it. Ha! Quality sleep is pretty much nonexistent. On any given night, I wake up to use the bathroom four to seven times. Or I wake up and stare at the ceiling unable to go back to sleep. Or the baby decides he wants to beat around like a drum, so his movement wakes me up. Fun times! Because of this, naps, especially weekend naps, are a very real thing. For example, I took three three hour naps over the course of this past weekend. While this should be a highlight, every long nap leaves me feeling a tad bit guilty. There’s still so much to do! Third trimester hunger is a beast. Over the past few weeks, I can’t seem to eat enough. BUT, most foods give me heartburn. It’s very much a double edged sword! Calf cramps creep up on me a couple times a week. And boy are they painful! My biggest fear to date was experiencing a calf cramp when Vishnu wasn’t home. And guess what? It happened this past Friday night when he was working an overnight shift. I remembered some of the tips he shared and all ended up ok, but it hurt so bad! Swollen legs, ankles, and feet are the norm around here. Elevating my feet, drinking lots of water, and wearing compression socks helps, but on some days it’s just unavoidable and scary looking! Lower back pain now occurs more during the day versus solely at night. Standing for too long or sitting the wrong way will almost always bring on uncomfortable pangs of pain. Bending over for any reason whatsoever is an Olympic feat in and of itself and requires a ton of effort. Putting on anything other than slip on shoes…forget about it! I actually freaked out about hurting the baby from bending over. But after Googling and reading multiple sources, I learned you can’t hurt the baby from tying your shoes or picking something up off the floor. Phew! My memory is shot. You guys, I couldn’t remember my OBGYN’s name for the life of me the other day. Unless I write it down, there are no guarantees. My regular exercise routine has officially been interrupted. I went from five heart pumping workouts a week to lots of walking, some weights, and maybe a couple of prenatal workouts (BodyFit by Amy of course!). On days where a scheduled workout just isn’t doable, I try to walk to and from work (~2.4 miles total). As it’s always been, staying active is my ultimate goal! I’m a little all over the place emotionally. Just ask Vishnu! Literally anything can set me off. I mean, I teared up at the national anthem during the NBA finals. I also don’t feel ready, even though I know anything we do from now until the delivery is a bonus. My mama friends tell me I’ll never truly feel ready, and while it helps to hear that, I often get emotional because I’m overwhelmed. Unlike anything else I/we have taken on thus far, this is one life change we can’t 100% anticipate or plan for. Super exciting and nerve-racking at the same time! The one thought that always helps is thinking about how people have been at this whole parenting thing for thousands of years. Can’t be that hard, right?! Humor me! Obviously, I’ve painted a grim picture. My excitement about being pregnant and meeting our little guy far exceeds any of the above. In fact, I’d go through it all again if I had to! But that doesn’t equal rainbows and unicorns. 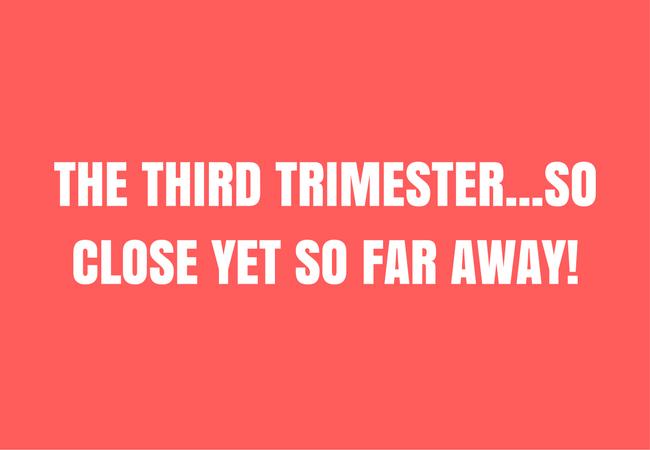 Almost every pregnant woman will tell you the last few weeks feel like years! And it’s so true because you’re uncomfortable in most every way possible. A very small price to pay though! And if I’m being honest, my overall pregnancy symptoms have been fairly mild compared to some. 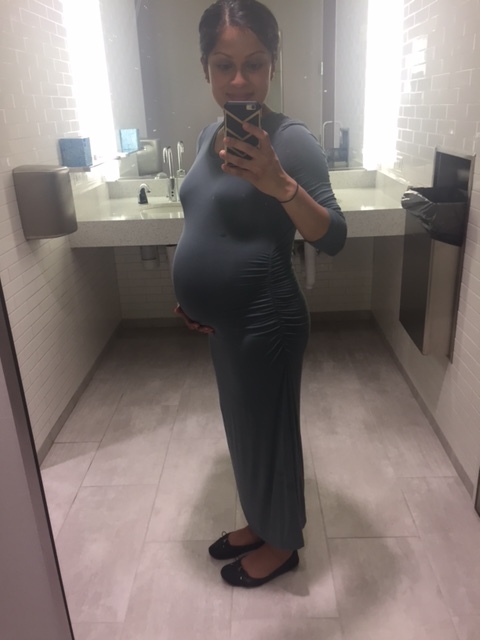 But for the sake of keeping it real, you have this post with all of my third trimester thoughts and experiences (so far…#36weeks!). You’re welcome! Looking back on the past 34 weeks, I really can’t complain too much. No morning sickness, no food aversions, no headaches, etc. Just a growing belly. With that being said, a growing pregnant belly can and does pose a couple of challenges – lower back pain and swollen feet/ankles being two big ones. Both of which are super common and nothing to write home about if you know what I mean. Before I share more about a couple of products that are truly helping to alleviate my back pain and swelling, please note that any and all symptoms should be discussed with your doctor. Pregnancy is not the time to self-diagnose. Ok, so I didn’t self-diagnose, but when my feet first started swelling, I did ask Vishnu what he thought. He said to bring it up at my next prenatal appointment and to start wearing compression socks in the meantime. Of course, me being me, I didn’t rush to Amazon to buy said socks. When I was still complaining about the on again off again swelling, Vishnu took matters into his own hands and bought me not one, not two, but SIX pairs of socks! While they’re definitely not super stylish, I can honestly say that these socks have alleviated my swollen feet and ankles. Trust me, I’ve put the compression socks theory to the test. For example, I forgot to take them with me to Atlanta and my feet were swollen for the duration of my trip. Not fun at all! I didn’t make that mistake when we went to Scottsdale and took all six pairs with me! Annnnd…no swollen feet…at all! Similar situations have happened locally where I sometimes forget to wear the socks, and I end up with elephant feet. But take the same situation + compression socks and no swelling. Good call, Vishnu, good call! My back pain started fairly early on but usually only reared its ugly head at night. I tried everything to help lower the pain and increase my sleep – a pregnancy pillow, extra regular pillows…everything. Once again, Vishnu told me to talk to my doctor about the pain and also suggested that I start wearing a maternity belt in the meantime. What a genius! This belt helps with my nighttime back pain and also helps alleviate the pain that’s started popping up while doing normal household things. In fact, I don’t think I could’ve made it through our move without it. While my body ached afterwards, my back was ok! I have a feeling this belt is going to be my BFF for the next 6ish weeks as my nighttime back pain starts to dissipate (it’s actually getting better!) and my daytime back pain revs up. All I can say is HOME STRETCHHHHHHHHHHHH! We’re almost at the finish line! 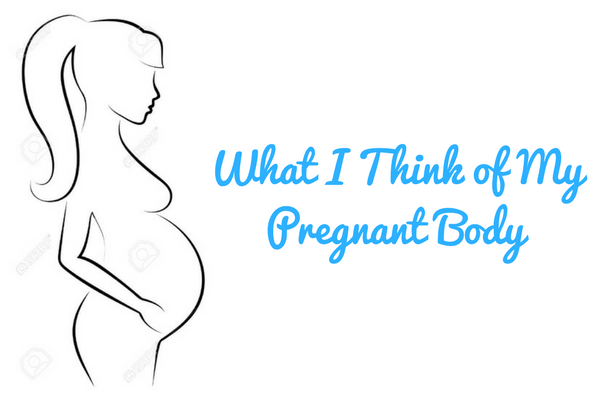 What I think of my pregnant body. Whew, what a loaded title, huh?! With that, I’m not going to hold back with this post. I’ve been formulating it in my head for a while now, and I figure it’s time to get my honest thoughts out there. Get ready for some realness, and please note that the following is 100% my story (because every pregnant woman and her pregnancy are different). First and foremost, I want to start off by saying that I’m beyond grateful for my body and what it’s accomplished over the past 8.5 months. On the flip side, the changes that come with this territory haven’t always been easy to swallow. Oh, and we can’t forget about the hormones! Long time readers know I’ve had my fair share of ups and downs when it comes to body image issues. Let’s just say I haven’t always been so body positive with myself. Like a lot of women, I tend to scrutinize and criticize more than love. For the sake of this post, let’s say this mindset is my set-point. When I first learned I was pregnant, I was obviously over-the-moon. But pretty soon, the reality that my body was going to change (A LOT) set in. I’m not proud to admit it, but given my ever-evolving relationship with my body, I thought about the changes more than I should have. In fact, I had a few emotional breakdowns (my poor husband!) where I cried about my clothes not fitting, my thighs/arms/you name it getting bigger, etc. Don’t get me wrong. I wasn’t naive. I knew how lucky I was to even be pregnant, and I also knew that pregnancy equaled change. It was just a tough pill to swallow at first. 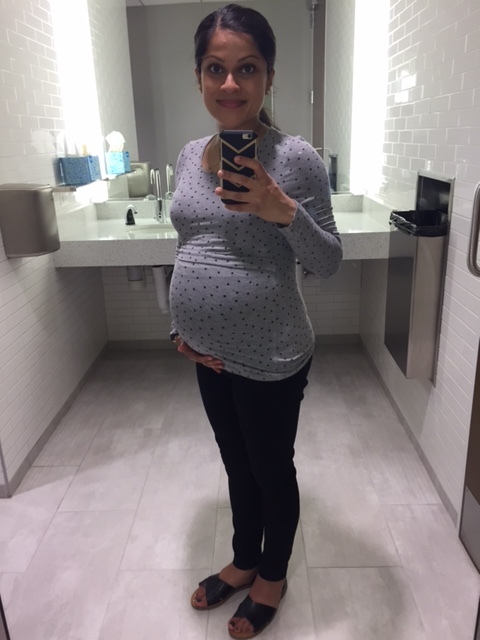 My dissatisfaction lasted through the first few weeks of my second trimester…until my belly really started to ‘pop.’ For some reason, seeing my stomach go from this roundish shape to an actual round pregnant belly turned on a switch in my head. It sounds so bizarre, but most every negative thought disappeared over time. Instead, I was filled with extreme gratitude for what my body, the one I’ve had a love/hate relationship with for so long, could do and was doing. Growing a freaking human! I finally realized what a miracle all of this was and haven’t looked back since. 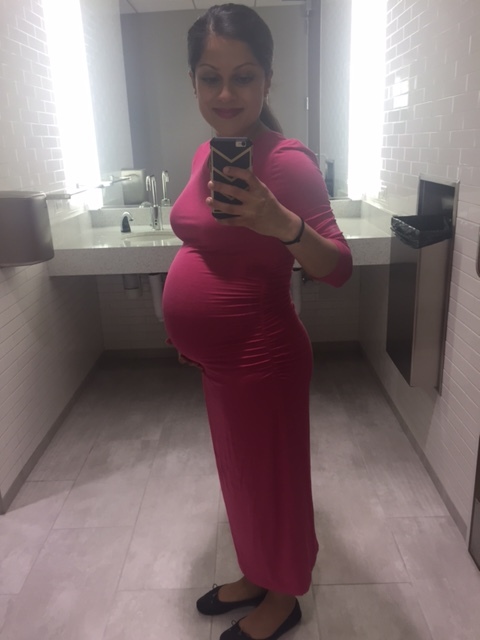 I should also mention that I thought it would take Vishnu and I a lot longer to get pregnant than it did (for many reasons I won’t go into right now). I was prepared to have to wait and potentially use medical interventions to get us to the finish line. But God/the Universe had different plans for us…and here we are. Because of this, part of me feels very selfish for my preliminary focus and thoughts. But at the end of the day, I’m just glad I got to a positive space where I smile bigger than I ever have when I glance in the mirror. So yes, while my thoughts have evolved with time, I can truly say that I’ve never been prouder of my body and happier with the way it looks. In fact, when I now think about all the changes it’s gone through, I’m that much more excited about bringing our little guy into this world because it’s this very body that’s going to do so much of the necessary work it takes to raise a healthy baby. This body is going to feed (hopefully! ), carry, play with, embrace, snuggle with, and most importantly, love [with every fiber of its being] our little guy. Regardless of my past, I’ll always be thankful for the changes I’ve experienced and will likely continue experiencing because they serve as a reminder of this crazy miraculous nine month journey that I wouldn’t trade for the world. Let’s consider this my new (and improved!) set-point. For anyone experiencing similar emotions and thoughts, please know you’re not alone. Pregnancy is an absolutely beautiful thing, but it’s also hard in so many ways. At the end of the day, you and your body are are miracle workers, and all of these changes will soon be worth their weight in gold (and so much more)!